Lemons and Lavender was a pleasant surprise. I expected the main focus to be cleaning recipes and there are several cleaning solution recipes in the book. But as the subtitle says, it's an eco guide to better homekeeping, not just housekeeping. 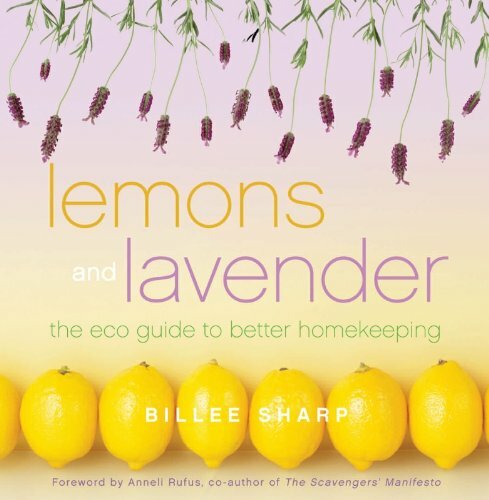 The book is about making a home and making environmentally aware and conscious decisions. A lot of it seems obvious to the experienced homemaker and DIY enthusiast. People like that will enjoy the recipes and possibly find new ideas in the tips. But for the beginning homemaker? Someone just starting out in their first apartment, or someone didn't grow up in a household that was thrifty and environmentally conscious the ideas and instructions will help set them on a workable path. One of my favorite things about this book is that it is full of thrifty ideas, you can save money while having a greener home. It seems like so much is marketed for people who want to make eco-friendly choices but it's frequently more expensive and considering packaging and shipping- not necessarily the best choice. The ideas in this book won't take that much time, or in the case of gardening, the time can be very enjoyable. They are also inexpensive ideas. It has recipes for cleaning solutions, recipes for inexpensive, healthy meals, some tips on doing minor fix it projects yourself and tips on how to find instructions to do even more things. It has recipes for paints and inks, and instructions for making your own wrapping paper. It's the same kind of DIY ethics that were in my household growing up. The cooking section includes information on starter ferments like pickles, sourdough and yogurt. Crafty ideas include some things for holidays like how to make a pinata or how to dye Easter eggs naturally. The repair section has a bunch of tips for trouble shooting things like a running toilet. There are tips on how to use essential oils for everything from upset tummy to stopping mold in a bathroom. There is an awful lot of information covered in here for a wide range of topics. The other thing about this book is that it's very readable. A lot of times with these kinds of books, you'll skip around, but this one that I was able to read cover to cover. The author writes in an accessible, chatty way that makes you feel like you've got a good neighbor giving you tips. She comes from England originally, but has lived here long enough that the recipes are in easy to follow US volume measurements. There are some very English recipes and language that are just charming and a joy to read. If you use my Amazon links to buy the book, it helps support this site and my book addiction.